Half term is rolling to the finish all too soon. The children return to school tomorrow. The house will be quiet and still. The dogs and I will slowly find our rhythm once more and soon we will be happy in our gentle solitude. But, I will miss those two noisy little beings, gone each day, from 9 'til 4. I will miss the laughter, the tears, the jokes and the squabbles, the busy silences and the frequent floor shows. 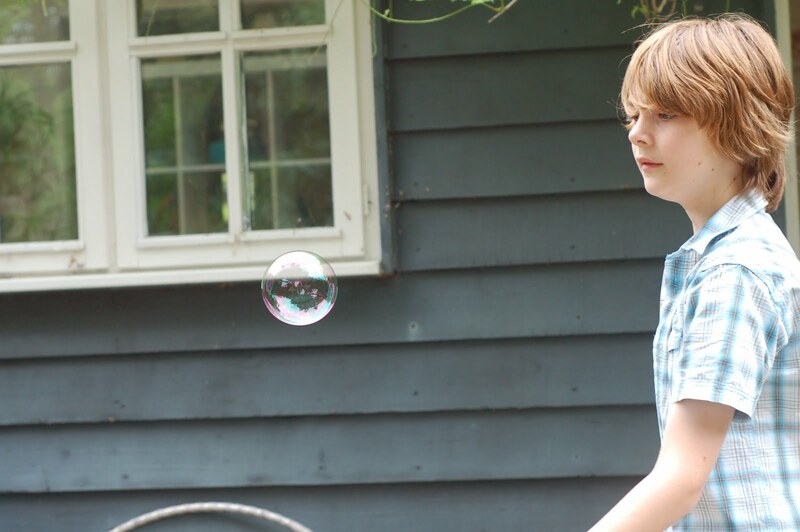 I will long for the end of term yet, each half term, each summer break, each winter holiday, they grow a little older, a little further from me and it rather breaks my heart for I know that one day there will be no one blowing bubbles for my pleasure and amusement. Oh I really know what you mean! One of mine is off for another week,but they are all growing up so fast! Our last day today too - it has gone way too fast. The half term and their small-ness. As mum of two teens I know just how you feel! They just grew up in a blink - enjoy them while you can! They do grow up before you know it but then they please and delight in different ways. I miss my boys being small but I love them being grown up too. Enjoy each day. Beautiful bubbles - those are magical pictures. 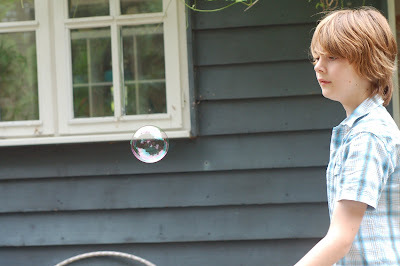 I too felt sad when my children grew up and those little people seemed to disappear...but now I have grandchildren and the bubbles in my garden have come back!! You are right to enjoy each moment of your children's childhood - such a precious time. i have a three year old and a baby, and i'm already starting to see the older one grow more independent and less reliant on me. i know that's part of me doing a good job as a mother, but a tiny part of my heart breaks as i know it's just the start of that process in which you're a bit further along. it doesn't sound like it gets any easier! Oh, it just doesn't seem right for your littles to be going back to school just as summer is beginning! School has just ended here, and 3 (almost) lovely months of summer break and lazy days lie ahead. Don't worry - as each stage passes, another equally enjoyable one takes it's place. My son is now 32, but he still enjoys being 'mothered' when we see each other! I often feel like that with my two, that wanting to freeze the moment. But then they move on, become a bit older, develop in a different way and that turns out to be fun too. I suspect it could be really good fun to have grown-up children. You've echoed my feelings exactly. My two went off to play with friends for a couple of hours today and I had No Idea what to do with myself. Tomorrow - well, I'm not looking forward to it. I'm much closer than you to the end-of-bubble days. It breaks my heart, too. I especially love your first photograph. How did you capture those ephemeral bubbles? My youngest daughter and I were picking elderflower last week, too. She insisted on making the cordial herself, though! Your kids are getting so big! Mine will be all done for the summer soon. We can't wait.